I wanted to expand my Indian dishes beyond Gujrati food and decided to make this simple yet tasty dish. I had some cauliflower in the fridge, and instead of making my usual recipe, I adapted this recipe from Show Me The Curry. I made a few changes to the original recipe: I used broccoli, added a lot more tomato sauce, and garnished with some fresh cilantro to give it some more flavor. I still haven’t had a chance to make fresh naan, so we ate this dish with garlic frozen Naan from Trader Joe’s, which in my opinion is a great backup. My husband and I loved the dish and will definitely be making it again sometime soon! 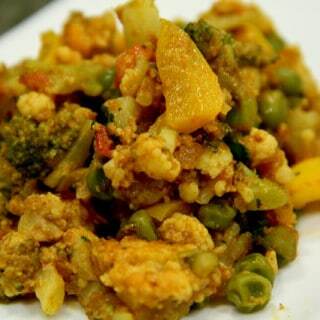 A medly of different vegetables combined with spices to make a delicious healthy dish! Boil a pot of water and add salt and turmeric powder. Add the cauliflower and broccoli. Boil for 3 minutes. Strain the veggies and place them in a bowl of ice water to stop them from cooking. Drain and keep aside. In a non-stick pan, heat oil. Add onions and cook until light golden (2-3 min). Add ginger and garlic and saute for another minute until fragrant. Add tomato sauce and cook until the oil separates. Add the bell pepper and green peas. Cook for another 2-3 minutes. 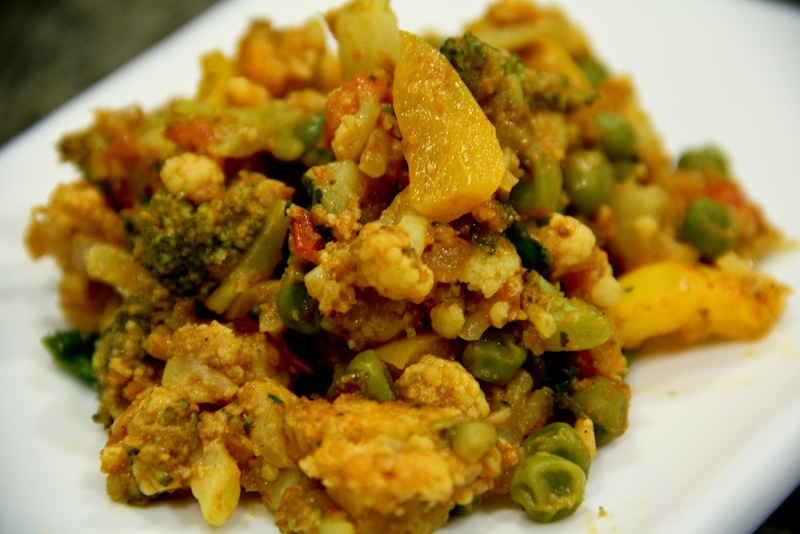 Add the cauliflower, broccoli, salt, coriander, garam masala, and red chili powder. Mix well and cook until veggies are tender, not mushy. Sprinkle a little water over the dish occasionally to provide moisture if the dish drys out to keep it from burning. Adjust the amount of salt if needed. Add fresh tomatoes and cilantro. Cook for another 1-2 minutes. Add lemon juice and mix. Serve hot with naan or some rice. You can mix in other vegetables based on what you have available. The basic cooking method will still apply. I highly recommend the roasted ground cumin over regular ground cumin because of the flavor profile.